Stay connected with your vehicle, no matter where you are. Customized convenience, assist, service, and connectivity – it’s at your fingertips with the easy-to-use HondaLink app. Download today! Access to digital guides such as the owner’s manual to learn about your vehicle. Find out if your vehicle is involved in a recall, and quickly schedule an appointment to make the necessary repairs. Find a Honda dealer near you and easily book a service appointment. Save your parking location and get walking directions back to your vehicle. You can also set a timer to remind you when the meter runs out. 24-hour Roadside Assistance is available to you in the U.S., Canada, and Puerto Rico for the duration of your warranty term. Check the mileage, fuel range, and oil life right in your app. Receive information about warning lamps or maintenance minders for your vehicle. Save locations to your app to quickly send it to your navigation system. A live agent will reach out and check on you and request that help be sent in the event of a crash. A live agent will stay on the call with you and request that help be sent in the event of an emergency. Restore your audio and navigation system to factory defaults with the app. Get towing and repair services using the blue LINK button in your vehicle. Get comfy by cooling down or warming up your car ahead of time. 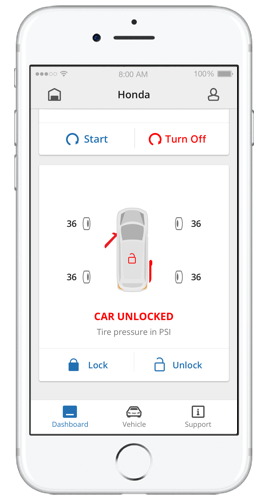 Remotely lock or unlock the car doors using the app. Receive a notification anytime your car enters or leaves a region set by you. Receive a notification when your vehicle has exceeded a speed limit set by you. Get notifications when your vehicle alarm has been triggered. Be able to find your car by seeing the location, flashing the vehicle’s lights, or sounding the horn with the app. Talk to an IVR system to search for places and get directions sent to your navigation system. Talk to a live assistant for topics such as making reservations, finding nearby special events, and much more.